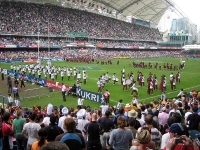 The Hong Kong Sevens is one of the biggest sporting events in the city and one of the most exciting rugby events on the international calendar. Top national teams compete in this famed event, while enthusiastic spectators party it up in the stands, particularly in the legendary South Stand where the music blares and the beer flows among the outrageously dressed fans intent on enjoying the rugby as well as having a good time. All the world's best rugby nations compete in the event and the competition is furiously contested. The games are short (15 minutes long) and fast - quite different to regular rugby matches - and the atmosphere for spectators is more light-hearted and festive than in big international matches. 40,000 spectators can pack into the stadium but this is just the centre of festivities and the event spurs a carnival feeling all over the city, with the party spilling into the streets and venues of Hong Kong.